Mommy Gossip: Do You Love Your Wedding Ring? Do You Love Your Wedding Ring? How do you feel about your wedding ring? Every time you look at it do you fall in love all over again? Is it something you'd be proud to pass on to a special daughter or daughter-in-law? 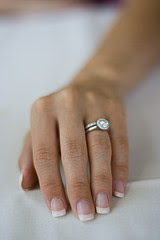 Or, are you waiting for that perfect 10th or 20th anniversary when you'll finally be able to get the ring of your dreams? For 12 years, I have been wearing a gold wedding ring. I love the style. But... for 39 years, I have hated gold jewelery. I have never purchased any gold jewelery in my life. So why I would choose a gold wedding ring. I will never know. And no, this isn't a picture of my ring. All of those who know me realized that the second you saw the tanned skin ;). Then last week, I met Trevor of Goldsmith Co. Jewelers in Provo, UT (my temporary home town) and as I was explaining my predicament, he offered to clean and plate my ring in white gold for free. The funny, yet not surprising part... when I came home and asked the hubster what he thought... all you women know exactly what his opinion was... he couldn't tell the difference between the before and after. Are you kidding me??? Men will be men! 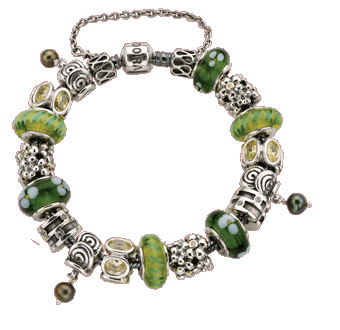 And all were amazing... even my new friend, the Pandora bracelet... the hottest trend in charm bracelets. I'm dying to get one of these babies. 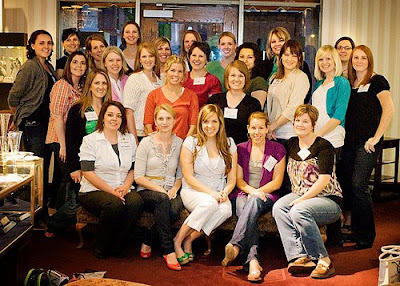 Eleven of the bloggers that attended the event are running giveaways on their blogs right now for the chance to win a $50 gift card to Goldsmith Co. Jewelers. You can enter all of their giveaways, but you may only win once. Also, you must either be able to claim your prize by Saturday, May 9 by visiting the Goldsmith Co. Jewelers store in Provo, UT or you must have a friend or family member that can claim it for you. The good news? You could use the money to put toward one of these amazing bracelets! 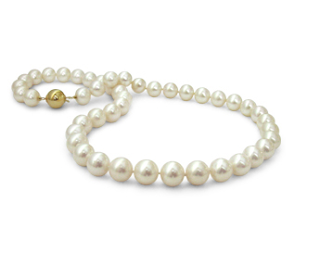 ...take it into Goldsmith Co. Jewelers in Provo, UT by Saturday, May 9, and enjoy a FREE strand of fresh water pearls for you or your daughter! While this coupon specifies one per person, as many people as are interested may print it out and take it in. So, pass it along to all your best guys friends and brothers so they have the perfect Mother's Day gifts for their wives! Your friends will love you! And, since you know I probably won't write again until after Mother's Day... please make sure and enjoy a wonderful day, pamper yourselves, marvel at your children, and hug your hubbies :). I will probably upgrade my ring someday. My ring is white gold, but around the baguettes, there were these little tiny raised yellow gold bands. When I had it replated, they redipped the entire thing in white gold. I like the look better, but it did make me sort of sad it wasn't the same ring anymore. So glad I have had the oppurtunity to get to know you this past week! I can't wait for many other party/events that we can get to know each other better at. You are KIDDING ME! I am so GLAD I caught this post. I have always worn gold jewelry so when my hubby asked me if I wanted gold or silver I chose gold. But since then I just LOVE the look of silver or white gold, but I am way to sentimental to ever exchange my wedding band. I can't believe that I can keep my same wedding band AND have white gold! I AM SO EXCITED!!!! And your ring looks fabulous! Well, I swore I never would trade in my ring, being a sentimental person, but I ended up doing it. For our tenth anniversary Jeff offered to upgrade the diamond. I fretted over it for a few months, then I started looking at new ring styles. I caught a glimpse at Katie Holmes' ring and suddenly everything I wanted was clear in my mind. I asked Jeff if we could keep the old ring (because I really am a sentimental gal) and just upgrade by getting a whole new ring. I designed what a wanted... an Edwardian pave set in white gold with an oval stone in a crown-style setting. It feels good to have a ring that I LOVE and that represents my style. The first one was picked by my husband and just wasn't me. I'm glad you took advantage of the chance to get what you wanted! That's the Jyl I know!! !